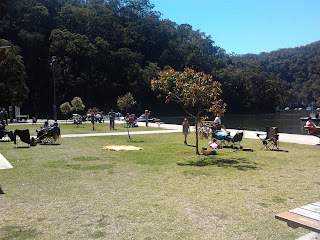 This morning we celebrated Father's Day at Berowra Waters, which is one of my favourite parks for kids. Down the bottom of a very steep valley and, if you are coming from the Berowra side, across a car ferry Berowra Waters feels like you are a million miles away from Sydney but it is really less than half an hour from Wahroonga. The park area is right on the edge of the water and has a wonderful (and fairly new) pirate ship and rowing boat for kids to play on. 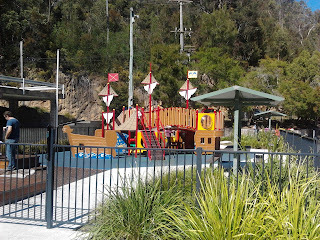 The pirate ship has two levels, climbing walls, bridges, slippery dips and is great for imaginative play. The play equipment is fully fenced and there is one under cover table inside the fence plus the two boats, some rocks and low platforms/stages for jumping and playing. Berowra Waters is surprisingly sunny for a park in the bottom of a valley and the play equipment is in the full sun so make sure you take hats! Also on the edge of the water there is a big grass area with quite a few tables (many of which are under cover), several BBQs and, at the far end, a boat ramp. Past the boat ramp there are several sets of sandstone steps going down into the water and Wild Man has had a lovely time paddling on them in summer. Next to the park area there is also a marina so there are lots of boats coming and going, which my kids love to watch. You can hire a boat or kayak from the marina shop. The marina has a lovely a cafe called the Fish Cafe. They have lots of outside tables that are on a veranda overhanging the water, so there is lots of kids to watch while they wait for the food. They are open for breakfast and lunch 7 days, plus dinner on Friday, Saturday and Sunday, and are very reasonably priced. The Fish Cafe does take away food and coffee and the marina shop next door sells ice-creams. 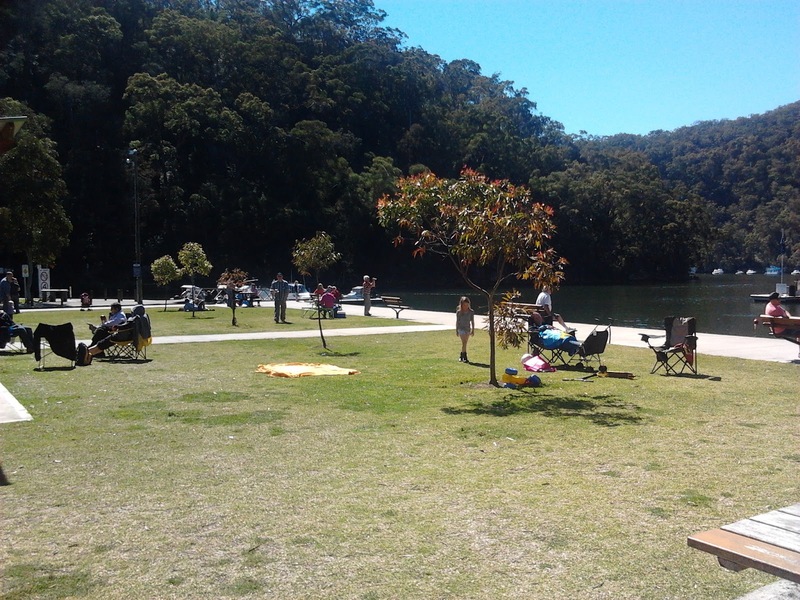 Berowra Waters is one of those places that you can take the kids and just potter around - watch people fishing, have a play, grab a coffee, go for a paddle if it is a hot day, supervise the boat ramp or just sit on the grass and marvel that such a beautiful place is so close to Sydney!